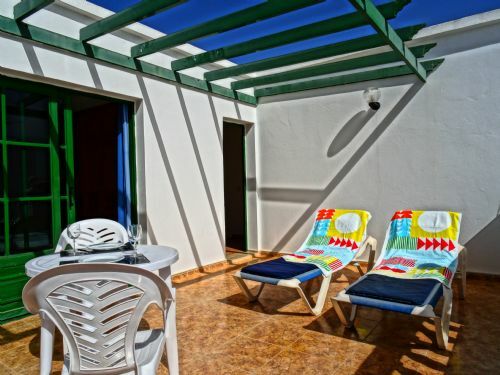 Villa Dorada is a detached 3 bedroom, 2 bathroom modern villa, with private pool in a great location, just an 8 minute walk from the beach, shops, bars and restaurants. This two storey house has off road parking for one car to the front of the villa. The interior is in a modern boutique style. On the ground floor there is a lounge/ diner with patio doors to the terrace. This has comfortable lounge seating and a table and chairs for indoor dining. 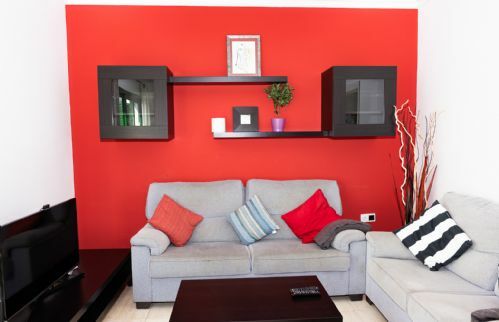 The TV has a full range of channels, via IPTV from a range of countries and the villa has wi fi for your use. Through the patio doors or via the lockable side gate from the parking area is the enclosed rear terracing with a private pool that is 6m x 3m at its widest. This has a ladder for entry and is 1.3 -1.5m deep. The main terrace is accessed via the patio doors from the lounge. Sun beds, umbrella, dining table and chairs and a built in barbecue for your relaxation and alfresco dining. Across the hall is the kitchen which is fully equipped with large fridge/freezer oven, hob, microwave, dishwasher, kettle, toaster and coffee machine and table and chairs. The utility room has washing machine, airer, iron and ironing board. Also on the ground floor is a twin bedroom and a modern shower room with large shower, basin and WC. On the first floor there is another twin bedroom, a double bedroom and another shower room with large shower, basin and WC. Off the landing and the double bedroom there is access to a large balcony. 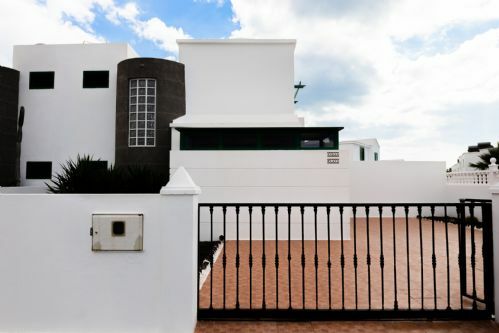 The great location being close to all the amenities of Puerto del Carmen but in a quiet residential area will suits families and couples alike. If you are a large group we have Villa Plata just four doors away. Local restaurants/ bars: 5 minute walk (400m) south-east to Pizzeria Mozzarella, a family-friendly restaurant. Or a 6 minute walk (500m) south to Spinnakers, a family-friendly Irish restaurant and bar on Calle Anzuelo with outdoor seating and a stunning sea view. Supermarket: 6 minute walk (500m) south to HiperDino Express supermarket on Calle Anzuelo or 19 minute walk (1.5km) east to Lidl at No. 1, Calle Juan Carlos I, which is a large well-stocked supermarket with a great meat counter for your BBQ. When paying just ask a staff member to call a taxi for you and they will happily do so. Driving there 3 mins (1.8km) but the return journey will be 5 mins (2.8km) because of the central reservation. 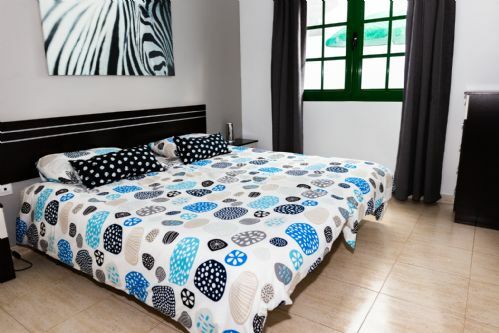 Tourist Information Centre: 8 minute walk (750m) south down Calle Anzuelo - located beach side. Main Beach Road: 8 minute walk (750m) south to the Avenida de las Playas, the long 'strip' of restaurants, cafes, bars and shops of the greatest variety that runs parallel to Playa Grande. Beach-side, the palm-tree lined promenade is perfect for strolling, jogging, cycling on the red brick cycling lane (many bicycle renting places available), or just people watching. Beaches: Playa Grande is a 9 minute walk (750m) south. A long stretch of fine-grain sand with calm waters, a very gentle shelf and little current so paddling and swimming are very safe. Playa Chica, a 26 minute walk (2.2km) south-west is a pretty little cove surrounding by volcanic rocks, which is perfect for snorkelling and diving (a dive school is located here). Other sports enjoyed at Playa Chica are parascending, banana boat rides, single and double jet-skiing, Crazy UFO and Fly-boarding. 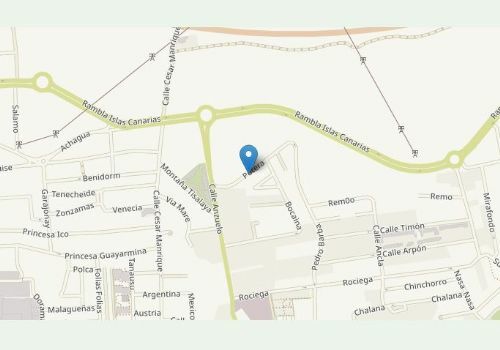 Biosfera Shopping Plaza: 24 minute walk (1.9km) west to No. 15, Calle Juan Carlos I. Four floors of shops, restaurants and amusements including Starlight Open Air cinema playing 2 English movies each evening, a billiard and pool hall, crazy golf, and Cine6D virtual reality motion rides. Old Town Harbour: 29 minute walk (2.4km) west - there are a wide choice of restaurants and bars in the harbour area. Great for lunch, dinner or a drink while an adventure playground keeps the children amused. Lots of choice of boat trips from the harbour including trips on a submarine diving down 50m, scuba diving and the water taxi to the marina at Puerto Calero. 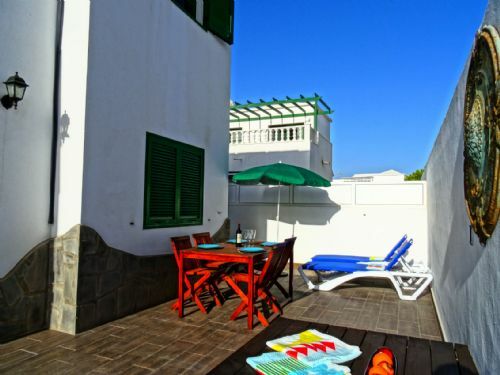 Golf: Lanzarote Golf is a public course 5 minutes drive or a 34 minute walk (2.6km). 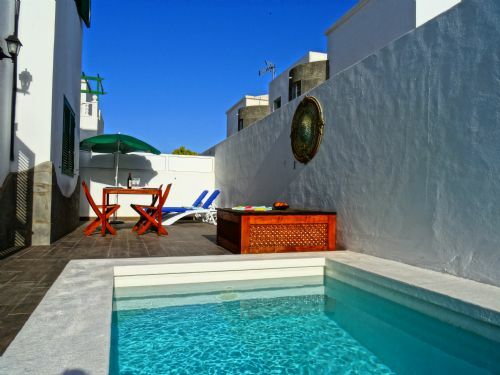 Puerto Calero: 70-90 minute walk (7km) south west along the coastal walkway and you will reach the marina at Puerto Calero, where there are lovely restaurants and gorgeous shopping. This walk is very popular with our clients. 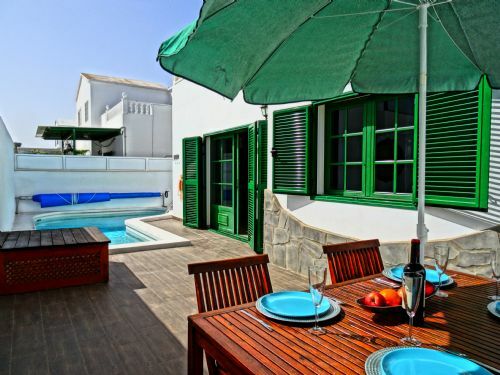 The restaurants in Puerto Calero are perfect for a long lazy lunch. The Water Taxi back costs 6 Euros and the last one leaves about 5pm. Rancho Texas Lanzarote Park, a 3 minute drive (2km). Displays of birds of prey, sea lions, and parrots and cockatoos and you can also see other exotic birds and reptiles, including the Komodo dragon. Also a cowboy lasso and whip show, and the children can enjoy canoeing and gold-panning, pony riding, and then cool off in the pool. The natural wonder of Lanzarote has a unique 'Martian' landscape and rare plant species. To the El Diablo restaurant, a 30 minute drive (25km). A unique experience is it to take a camel ride across the volcanic landscape (21 minute drive, 20km). A geothermally-heated water park 29 minutes drive south-west (27.6km). A go-karting track 11 minutes drive north-east (9km). Every Friday 10am - 4pm 100 stalls set up at the Plaza Varadero near the Old Town harbour for locally sourced fruit, vegetables and flowers, as well as handmade craft items, jewellery and clothes (600m). At nearby Tias, the Saturday morning 9am - 2pm Farmers market is an ideal place to purchase fresh locally produced vegetables much cheaper than the supermarkets (10 minute drive 6km north-east). Also, the biggest open-air street market in Lanzarote is on Sunday mornings 9am - 2pm in Teguise (28 minute drive 21km north-east). Late February, revel at the Carnival or if you’re visiting in July, don’t miss the folklore performances, folk singing, dancing and vibrant processions at the Feast of St Carmen, patron saint of the city and fishermen. IPTV - full range of internet channels. English, Irish, German, Spanish, Norwegian etc. Master bedroom - on upper floor, double bed, door to balcony. Ground floor, family shower room with large shower, basin, WC. Upper floor, family shower room with large shower, basin, WC. Pool has a cover which should be kept on when the pool is not being used for long periods. 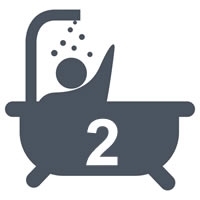 Overnight is essential as the water temperature can drop as much as 6 degrees. Size - 6m x 3m at the wide end. Depths - 1.3m -1.5m Ladder for entry at 1.5m end. 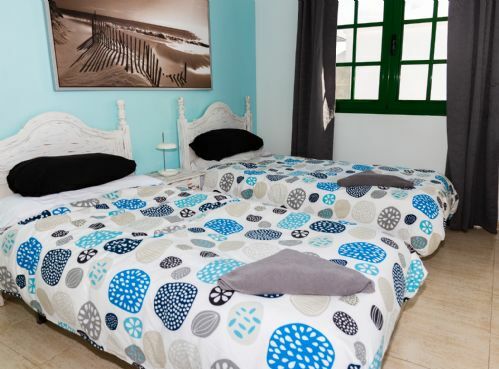 The villa will have a mini clean and fresh bed linen after 7 nights if staying for 14 nights. Bath, hand and tea towels will be changed after 7 days. Welcome food pack of Cava, water, beer, fizzy drink, tea, coffee, milk & biscuits. If you would like anything additional upon arrival, please request.